Nolan Bushnell still thinks about the vacation that he should have taken back in 1976. The man who founded Atari along with Ted Dabney says that if he had just taken a break, he would not have started a catalogue of events that he believes doomed the gaming giant. 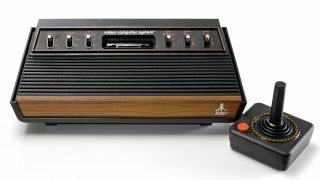 With the next generation of consoles about to arrive, he firmly believes that Atari consoles would be competing with Xbox One and PS4, but for a bad decision that he regretted soon after making. 37 years on, and he tells TechRadar that the stresses and strains of running one of the fastest growing companies of all time had left him drained. And it was this that made him take the fateful decision to sell the company to Warner. "Absolutely Atari could be competing with Xbox and PlayStation today," he tells us. "Under Warner it committed suicide. It wasn't homicide, it was self-inflicted stupidity. What you had was a bunch of record guys thinking they knew what the game business was about - I could catalogue the screw ups they made. "I would have liked to have taken Atari to another level. If I could go back in time I would not sell to Warner. Take the company public, raise money that way - I think I should have just taken a vacation. "You are going so fast, and a lot of people don't realise that when you are growing you are a consumer of capital - and so I was constantly chasing things like payroll! Even though we were profitable and growing, we were just chewing through capital." "It felt like a relief at the time to sell it, but about six months later I regretted it. "The thing that really wakes you up is when the new management goes in a direction that you think is absolutely bloody stupid and you just say: 'You don't have a clue,' and they say: 'Nolan, this isn't your company anymore.'" "The early days of Atari were like being on the back of a kangaroo - they were heady times"
Bushnell's exit from Atari clearly remains a source of regret. He refers to the company "as my first big one," adding: "It represented turning me from a baby entrepreneur to an adolescent at least, and I learned so much. "Oh man the early days of Atari were like being on the back of a kangaroo - they were heady times. "I still game - I like Minecraft right now - but I can say that I like it and I love it and I play it, but I'm real close to being over it. "I lose interest when I feel like I've explored the vertices of what's going on. No, I won't be at the front of a queue for Xbox or PlayStation." It's fair to say that Bushnell did not rest on his laurels after Atari's sale and his subsequent exit from the company he still loves. He also came up with Chuck-E-Cheese restaurants, Etak digital mapping and a whole host of other ideas, many of which were well ahead of their time. "Bright shiny objects are fun," he explains when we ask him about his scattergun approach to what he involves himself in. "I think they call that magpie syndrome. I just love new things, and once I've got that figured out that's kind of good enough for me in most cases. "When I say: 'Gee, if I'd stuck that out I'd have made four or 10 times as much money,' I think: 'I've got as much money as I need.' And I know that had I been as big a workaholic as I could have been, I wouldn't have nearly the relationship I have with my kids."